Signs of ageing have to be tackled as soon as you see their first sign to ensure that you retain the natural youthful texture of your skin whilst maintaining the pH balance of your skin. 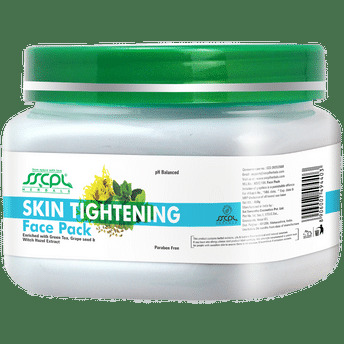 Go the herbal way to get forever rejuvenated skin with the SSCPL Herbals Skin Tightening Face Pack. Enriched with skin brightening, healing, moisturising and anti-ageing ingredients such as lime, avocado, cinnamon and green tea extract give your skin the perfect repair system with gentle exfoliating properties to reduce fine lines and wrinkles and leave you with soft and supple skin!